It’s that time of year again. Chilly weather, falling leaves, and squash is in season. The grocery stores have piles of different options; butternut, spaghetti and my favorite, pumpkin. I’ve been in denial all month. I’ve refused to accept that summer is gone. I’m not a fan of the cold, or the yard work associated with autumn, or the looming threat of shoveling snow. I’d rather have summer all year round, thank-you very much! 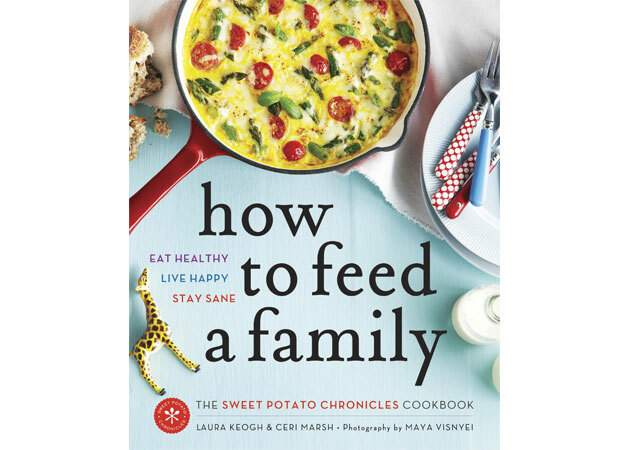 When I received a copy of How to Feed a Family by Laura Keogh and Ceri Marsh of The Sweet Potato Chronicles blog, I was instantly in love with it. The multiple recipes using squash like zucchini and pumpkins really helped me realized that resistance is futile and it’s time to accept that autumn is here and there’s nothing I can do about it! Time to embrace it! So what better way to accept the changing seasons, than to make cheesecake! 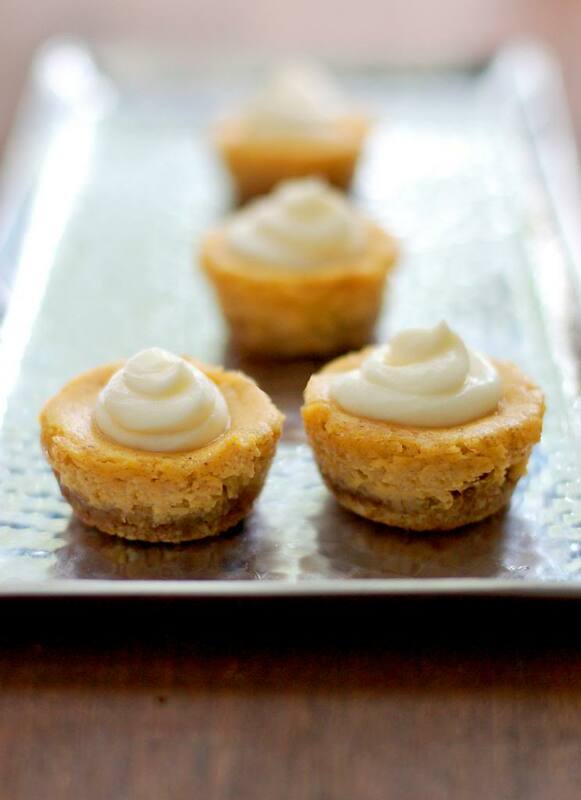 These pumpkin cheesecakes are adorably mini and include a delectable gluten-free almond crust. Trust me, you will not miss the traditional graham cracker crust. Another thing I love about this recipe is that it’s not overly sweet, which obviously means it’s healthier, right? I used homemade pumpkin puree, made from a sugar or pie pumpkin. 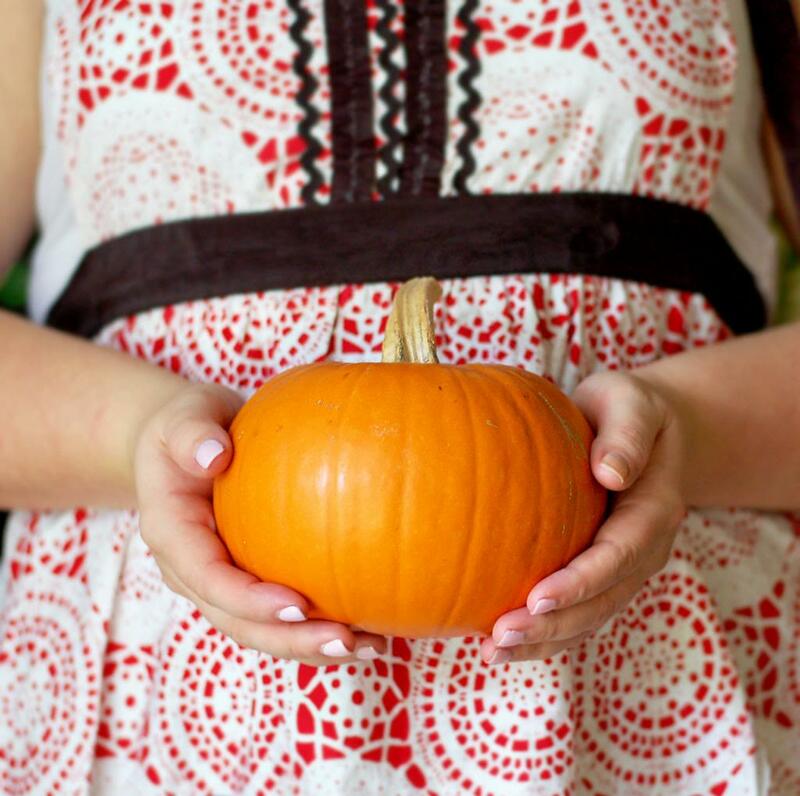 When making pumpkin puree, you want to avoid the standard jack-o-lantern pumpkin. I scooped the guts out, cut it into quarters and roasted at 400 degrees for 40 minutes. I let it cool slightly, then scooped out the flesh and pureed it in my food processor until smooth. I can’t wait to make more recipes from this cookbook and share them with you. There’s a wonderful french toast recipe that I have my eye on, which will help me use up the rest of my homemade pumpkin puree! Preheat the oven to 350 degrees. Grease the cups of two mini muffin tins. *I recommend using paper muffin cups inside the tin instead so its easier to remove and they are easier to pack for lunches. Place the almonds, pumpkin seeds, cornstarch, sugar, melted butter, cinnamon and a pinch of salt into a food processor and process until finely ground. Press about 1 tsp of crust into each muffin cup. Beat the cream cheese, mascarpone, sugar and maple syrup with an electric mixer on medium speed until light and fluffy. Beat in the pumpkin puree, yogurt and a pinch of salt, scraping down the bowl frequently. Add the egg, vanilla and almond extracts, cinnamon, ginger and a pinch of nutmeg. Beat until well blended. Pour the batter over the crust bases, filling each muffin cup two-thirds full. Bake for about 20 minutes, or until the mini cheesecakes are firm. *Disclosure: How to Feed a Family was provided to me at no cost by Random House Publishing. All opinions are my own.